Tomatoes grow on the vine at White Silo Farm. All experiments should go this well. White Silo Farm and Winery in Sherman added tomatoes to its crop list last year and the trial run exceeded expectations. Naturally, the farm revisited the tomato experiment this year and the 12-foot high plants are producing another banner crop of the juicy red fruits. To celebrate, the folks at White Silo did what they do best: “We decided we would have a festival,” Gorman said. The first Heirloom Tomato Festival at White Silo Farm and Winery took place Saturday. White Silo Farm and Winery hosts about 20 events a year, including art shows, farm-to-table dinners, barbecues, wine tastings and festivals for blackberries, raspberries, beets, quince and asparagus. White Silo’s 14 wine selections include dry and sweet choices from three grape varieties, blackberry, raspberry, black currant and rhubarb. Gorman said the winery will not make a tomato wine — at least not immediately. Gorman said the farm will have plenty of tomatoes to go around for the next few months. The tomato patch is producing about 30 pounds of fruit each day. While Gorman’s passion at the farm is the grape vineyards, family friend and New Milford resident Eric Olsen is the tomato guru for White Silo. 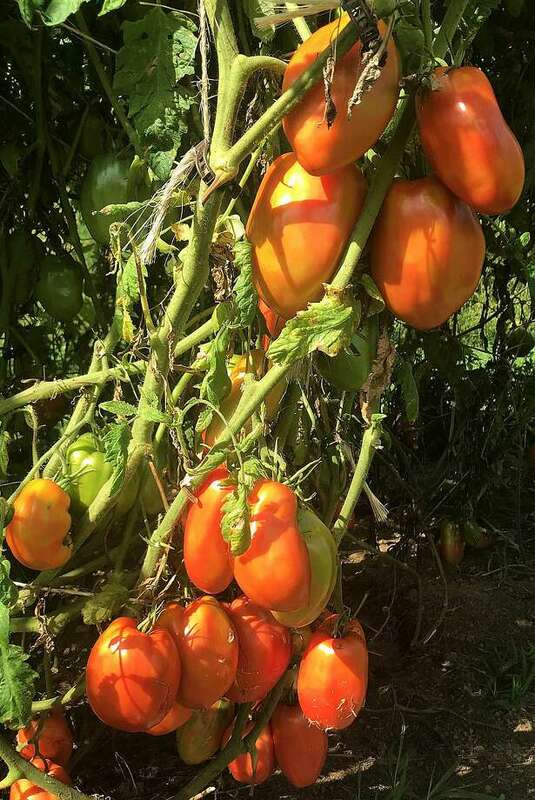 Olsen planted several varieties, including Belgium giant and Italian tomato tree, which grow more than 10 feet tall and are supported by steel rods. The farm is on Route 37 in Sherman and was formerly a dairy farm. Ralph Gorman, Eric’s father, purchased the 17-acre farm about 35 years ago and opened a pick-your-own berries business. Blackberries and raspberries still grow on the land, but they no longer offer a pick-your-own choice. A sizable vineyard also grows on the property and White Silo Farm and Winery is part of the Connecticut Wine Trail. A variety of other fruits and vegetables are also grown there. Eric Gorman got involved with the farm about 10 years ago. He is transitioning into the management role, but his father, 86, continues to be active around the property. Eric said his mother died about 10 years ago and she wished for the property to remain in the family. White Silo Farm and Winery may be reached at 860-355-0271.